The Sopwith Baby (also known as the Admiralty 8200 Type) was a development of the two-seat Sopwith Schneider. This aircraft had won the Schneider trophy in 1914 (the Schneider Trophy being a race for seaplanes or flying boats first contested in 1913). The Royal Navy Air Service (RNAS) placed an order for the aircraft in January 1915 and eventually 286 Sopwith Babies were delivered to the RNAS. Of these 100 were built by Sopwith at Kingston and 186 by Blackburn Aircraft at Leeds. Several more were built for export to Chile, France, Greece, Norway and the United States. Licensed manufacture was also undertaken in Italy by SA Aeronautica Gio Ansaldo of Turin, who built 100 aircraft for the Italian Aviazione della Regia Marina. 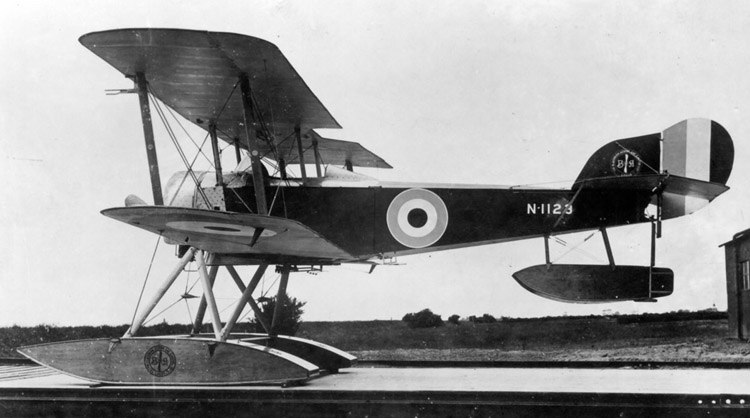 The initial production version of the Sopwith Baby differed little from the Schneider Trophy winning aircraft. The Sopwith Baby had a wooden structure with fabric covering and a Lewis gun was fitted, either above the fuselage firing through the propeller arc, without the benefit of synchronisation, or over the top wing and firing above the propeller. Sopwith Baby's were used as ship-borne reconnaissance and bomber aircraft operating from seaplane carriers and cruisers, as well as from naval trawlers and minelayers. Many were attached to RNAS coastal air stations located in England and Scotland and also at RNAS stations in Egypt, Greece and Italy. The light cruiser HMAS Brisbane operated a Sopwith Baby during April - June 1917 while operating in the Indian Ocean conducting a search for the German raider SMS Wolf. The aircraft was on loan to the Australian cruiser from the sea plane carrier HMS Raven II and was embarked at Colombo along with its pilot (Flight Commander Alfred William Clemson, DSC) and maintenance personnel. The aircraft was stowed behind the after funnel and hoisted from the deck into water for launching. This required calm weather to enable the aircraft to take off and land. When possible two flights were conducted a day to conduct searches for the elusive German raider which was not sighted and returned safely to Germany in early 1918. In June Brisbane was recalled to Australia and Captain Claude Cumberlege, who had arranged the loan of the aircraft to his ship, reluctantly returned the Sopwith Baby to Raven II. This was the first time an aircraft was embarked and operated by an RAN warship. Left: The Sopwith Baby embarked in HMAS Brisbane in 1917. Right: Royal Naval Air Service personnel maintaining a Sopwith Baby ashore.